My family is from South Philadelphia, a very close knit Italian section of the city. Growing up, eating St. Joseph Cakes on March 19th, was an Italian tradition. I’ll be honest, I don’t know much about the feast day, just that it took place during Lent each year. As you may know, Lent is the Catholic holiday where the faithful commit to fasting for 40 days as a form of penitence. But on March 19th the church grants dispensation from the vigors of lent and treats in the form of St. Joseph’s Cakes would show up at our house. I remember coming home and heading straight to the fridge where I was guaranteed to find a cardboard bakery box tied with white string filled with St. Joseph cakes. Sweet pastry dough, which is piped into nests and deep fried are filled with pastry cream or sweetened ricotta cheese. 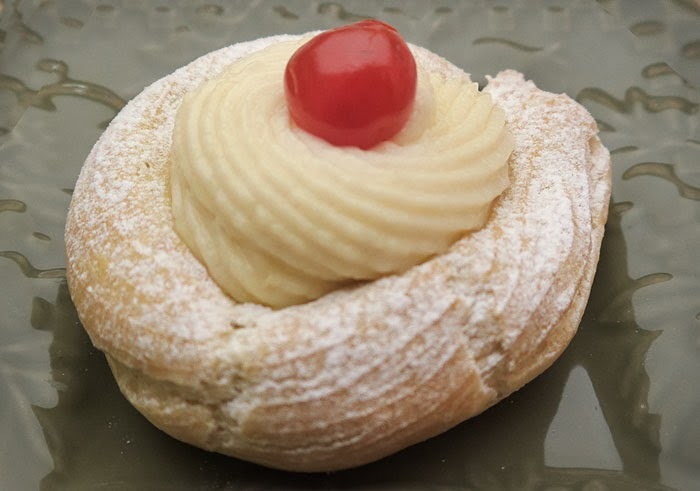 Similar to both the cannoli and the cream puff, St. Joseph cakes are still a popular Italian ritual in South Philadelphia. Having moved out of the city several years ago I am always on the “hunt” this time of year for St. Joseph cakes. This year I decided to take matters into my own hands and make them myself. If I had known how easy they actually were to make I would have done it years ago. Combine the milk with 6 ounces of sugar, bring to a boil. In a separate container, combine the second 6 ounces of sugar, plus the cornstarch, flour and salt. Add eggs and egg yolks and mix until smooth. Add egg mixture to milk and return to boil. Remove from heat, add butter and vanilla. Pour into pan, cover and refrigerate until cool. Makes approximately 4 1/2 pounds of cream. Preheat oven to 375 degrees F. Line a baking sheet with parchment paper. In a medium saucepan, combine water, butter, sugar, and salt. Bring to a boil. Remove from heat. With a wooden spoon, beat in flour and lemon peel all at once. Return to low heat. Continue beating until mixture forms a ball and leaves side of pan. Remove from heat. Beat in eggs, one at a time, beating after each addition until smooth. Continue beating until dough is satiny and breaks in strands. Allow the mixture to cool. Transfer the dough to a pastry bag with a large star tip. For each pastry, pipe a 2-1/2 -inch spiral on the baking sheet. Bake for 25 to 30 minutes until golden brown. Remove and allow to cool before filling. great post! you know i'm all over this holiday and it's foods! I am intrigued! I never heard of this cake! So it's like a giant Italian cream puff? You have inspired me to try these! I'm Italian, too and always wanted to make these at home. Such a pretty pastry.I love making new kinds of pastry. Can't wait to try this one. I always enjoy learning about new food traditions! I've never heard of St. Joseph cakes before and now I can't wait to make some. Thanks for sharing! My hubby is from Italy and I somehow always miss this day but it is pretty big for him because its the day they celebrate fathers as well as St. Joseph. Thanks for the reminder so I don't miss it this year! That looks divine. I'm drooling. I've never heard of this but it sounds delicious! I love pastry cream, yum! We also celebrate St Joseph's Day here in Spain. Its a HUGE holiday. We don't have a dessert like this though. Looks yummy! Mmmm, delicious! I love pastry cream. Looks yummy! We're Catholic, but have never really participated in the days when you can break your fasting. We always have just done it for the whole duration. I thought it was so weird when I first heard there were days you didn't have to do it!